Explain what the term particle-wave duality means, and why it is applied to EM radiation. We have long known that EM radiation is a wave, capable of interference and diffraction. We now see that light can be modeled as photons, which are massless particles. This may seem contradictory, since we ordinarily deal with large objects that never act like both wave and particle. An ocean wave, for example, looks nothing like a rock. To understand small-scale phenomena, we make analogies with the large-scale phenomena we observe directly. When we say something behaves like a wave, we mean it shows interference effects analogous to those seen in overlapping water waves. (See Figure 1.) Two examples of waves are sound and EM radiation. When we say something behaves like a particle, we mean that it interacts as a discrete unit with no interference effects. Examples of particles include electrons, atoms, and photons of EM radiation. How do we talk about a phenomenon that acts like both a particle and a wave? Figure 1. 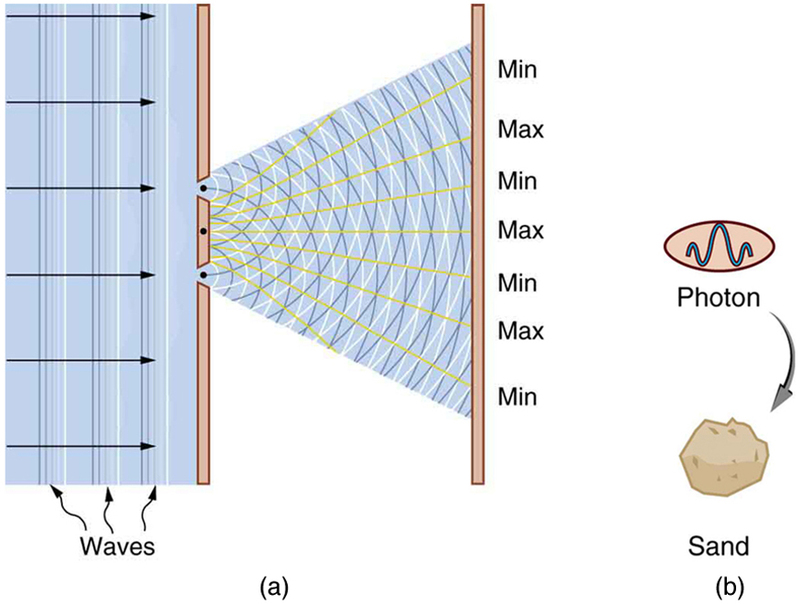 (a) The interference pattern for light through a double slit is a wave property understood by analogy to water waves. (b) The properties of photons having quantized energy and momentum and acting as a concentrated unit are understood by analogy to macroscopic particles. There is no doubt that EM radiation interferes and has the properties of wavelength and frequency. There is also no doubt that it behaves as particles—photons with discrete energy. We call this twofold nature the particle-wave duality, meaning that EM radiation has both particle and wave properties. This so-called duality is simply a term for properties of the photon analogous to phenomena we can observe directly, on a macroscopic scale. If this term seems strange, it is because we do not ordinarily observe details on the quantum level directly, and our observations yield either particle or wavelike properties, but never both simultaneously. Since we have a particle-wave duality for photons, and since we have seen connections between photons and matter in that both have momentum, it is reasonable to ask whether there is a particle-wave duality for matter as well. 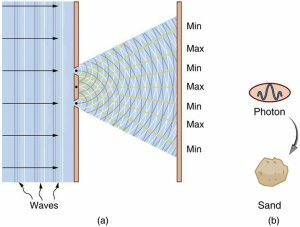 If the EM radiation we once thought to be a pure wave has particle properties, is it possible that matter has wave properties? The answer is yes. The consequences are tremendous, as we will begin to see in the next section. EM radiation can behave like either a particle or a wave. This is termed particle-wave duality. 29.5 The Particle-Wave Duality by OpenStax is licensed under a Creative Commons Attribution 4.0 International License, except where otherwise noted.